The Scottish government has committed in principle to introducing a charge on disposable drinks cups - a so-called "latte levy" - as part of its budget deal with the Greens. The aim is to reduce the number of single-use coffee and other drinks cups that being are sent to landfill or incinerated every year. What do we know about the scale of the problem? Keep Scotland Beautiful estimates that almost 500 million single-use disposable cups are given out in Scotland every year. These paper cups often are not or cannot be recycled - the basic materials which go into them generally are recyclable, but the process of doing it can be complicated, and costly. 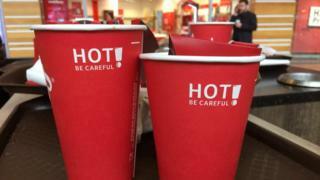 The Confederation of Paper Industries told MPs that only about 0.25% of these cups actually are recycled, and that "paper cups cannot be regarded as generally recyclable". Scottish Green MSP Mark Ruskell said: "They're very difficult to recycle because they're plastic and cardboard together. They end up being incinerated or in landfill a lot of the time, they end up in our communities as litter or even in the sea." The Scottish government has already removed disposable cups from its own buildings, and says this will save 450,000 of them being thrown away every year. What's to be done about it? Some big coffee shop chains such as Starbucks and Costa have introduced in-store recycling systems and targets. And many shops now offer a discount on hot drinks for customers who bring in or buy re-usable cups, rather than taking disposable ones. However, some campaigners want to go further than this and introduce a charge for each cup given out - similar to the charge for plastic bags in supermarkets, which saw a huge drop in the number of disposable bags issued. Having such a levy could give people an incentive to buy reusable cups, and encourage the industry to come up with alternatives. Given the number of cups given out daily in Scotland, it could also raise a significant sum of money - which could potentially be ploughed back into environmental projects or local efforts to tackle litter. Westminster's environmental audit committee called on the UK government to introduce a 25p charge on disposable cups in 2018, but this was ultimately rejected by Chancellor Philip Hammond. So a levy on these cups in Scotland could be the first of its kind in the UK. What are the arguments against the move? One concern is cost. The charge can be passed onto customers via price rises, or swallowed by the company giving out the cups - and some small businesses fear that they couldn't afford either. Gillian Hadden, who runs the Big Baps takeaway van in Aberdeen, told BBC Scotland that her customers "can't really withstand another price increase", and that carrying the cost herself would be a "huge outlay". This is disputed by Mr Ruskell, who argued that the plastic bag charge "hasn't been damaging for businesses". He said: "We're seeing many coffee houses around Scotland and the UK introducing reusable cups and selling those to consumers, and compostable cups are becoming popular too - so there are opportunities for business here as well." There is also an argument that coffee cups are a drop in the ocean of plastic and paper waste, and that efforts might be better focused elsewhere. The UK government has suggested that it would better for shops to offer voluntary discounts to customers bringing their own cups. Rejecting calls for a "latte levy" in his Autumn Budget speech in 2018, Mr Hammond said that "a tax in isolation would not, at this point, deliver a decisive shift from disposable to reuseable cups across all beverage types". Keep Scotland Beautiful meanwhile has launched the Cup Movement, a campaign in Glasgow to see more disposable cups recycled and a move towards reusable ones. So what's the plan, and when might it happen? The precise details of the Scottish scheme are still being worked out, but Finance Secretary Derek Mackay has committed "in principle to the use of charging in relation to disposable drinks cups", alongside other measures to reduce plastic waste. The plans actually date back to the 2017 Programme for Government, when Nicola Sturgeon appointed an expert panel to "advise on the use of charges, similar to the successful plastic bag charge" to "end the throw-away culture". An expert panel, led by Dame Sue Bruce, has been examining the issue and is due to report back in the coming months. The Scottish Greens are calling for an initial 25p levy per cup, to increase annually, with the proceeds going to local environmental projects, councils and charities. The government says its plans will "include consideration of whether revenue from any charge can be placed under the control of local authorities". Ministers have promised to draw up legislation in the 2019-20 parliamentary year, although it will take some time for this to pass through parliament and be implemented. So it could be 2020 or 2021 before any the new levy actually becomes a reality.